My friend Lois recommended this book to me, and she has never once led me astray. I loved this book, however I cannot recommend it to every one of my blog readers unhesitatingly ... you will have to choose on your own. It is a fantasy, featuring witches, vampires, daemons, and humans. It begins slowly, in my opinion, as we come to know our two main characters, Diana and Matthew, who are professors working and researching at Oxford. One-third of the way through this 600-page read, I could hardly put it down. 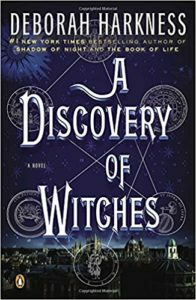 A Discovery of Witches is about vampires, witches, daemons and humans at one level. At another level, especially in the early context-setting pages, it is an allegory of brown people, black people, white people, gay people, Muslims, Jews, Democrats, and Republicans and how we manage to live together – or not – with our diverse cultures, values, norms, rules, beliefs, and covenants. Early in the book we learn that humans become nervous whenever the other creatures gather together in any sort of a group or crowd. Sounds quite familiar. This is decidedly not about vampires biting unwilling humans in the back alleys of New Orleans. Never happens once. It is actually about the discovery and manifestation of our individual and shared inner strengths and powers (whether we be witch or vampire!). I realized on page 515 why Lois recommended this book to me; I can see what is looming in the second book of this All Souls trilogy by Harkness, which I will read! And yes, there is a powerful love story that sparks both magic and war. Cool! And great to hear from you, Abigail! !